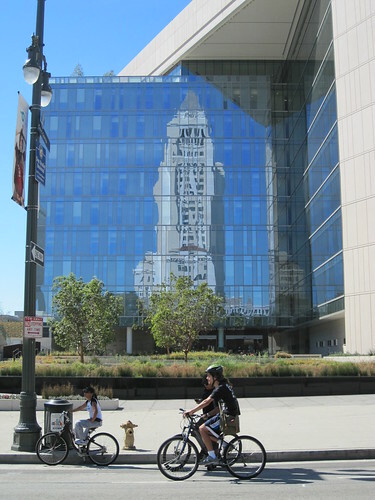 Is LADOT crucifying Chinatown @CicLAvia hub on Dodgers double cross? « Is the City Destroying a Bridge in Order to Save It? UPDATE: 1:08 PM PDT: CicLAVia’s Chinatown hub will be open but hours will be cut short to make way for estimated sell-out crowd at Chavez Ravine play-off game for Los Doyers. UPDATE: 7:43 PM PDT: CicLAvia’s PR director says Chinatown hub to be haggled over in meeting with mayor, CM Cedillo, LADOT, tomorrow, Thursday October 3, 2013. Hub will open, might have shortened hours. Stay tuned and stay engaged! “No, I just got out of a meeting with the LADOT’s special events guy and he is shutting down the Chinatown hub for CicLAvia. He said we need a 3 hour pre-game window. Game starts at 5:30 p.m. and CicLAvia ends at 4 p.m.”, replied George Yu, head of the Chinatown Business Improvement District. Yu and the BID, along with many local merchants and boosters in Los Angeles’ Chinatown have been waiting for this CicLAvia to finally showcase their community to the 100,000+ crowds expected to ride in the CicLAvia this coming October 6, 2013 from 9 a.m. to 4 p.m. in the heart of old Los Angeles. Their plans, the thousands spent in advertising, booking bands, stocking up on food and supplies, will likely all either go to waste or simply equate to cash flow locked up in inventory due to a controversial decision made by the Los Angeles Department of Transportation’s special events man, Aram Sahakian. Sahakian, a Glendale resident, and engineer bar none is one of LADOT’s problem solvers. Move Space Shuttle Endeavor? That task landed on Sahakian’s desk. Still, a 3 hour pre-game window before a baseball game in Chinatown? Sure, traffic is not going to be fun (when is it at Dodger Stadium), but CicLAvia doesn’t have much to get out of the way at 4 p.m. when the event is set to shut down and the streets will revert back to their current state – a place where bicycles are legally allowed to ride, I should add. Those walking will have the difficult task of moving onto the sidewalk at 4 p.m.
You can’t get more grassroots than George Yu and the merchants and property owners in Chinatown. These folks are hard working and were not so easy to jump on the CicLAvia bandwagon when the event started in 2010. Since that time, CicLAvia has shown that, when merchants embrace the public the public responds and patronizes businesses that open their doors on CicLAvia. Riding through Koreatown thousands had their palettes and their eyes opened to Korean food, culture, music, and their place in the multi-ethnic Los Angeles of the 21st century. Chinatown would like the same – but will paranoid fears of rowdy Dodger pre-game drivers and an idiotic and cowardly city hall culture doom Chinatown’s CicLAvia hub? As of right now, t-minus 4 days out from CicLAvia, it looks like that is the case. p.s. To those asking: I got this news from Yu’s mouth when he brought a bike in for a quick check-up after getting out of a meeting with Aram Sahakian. Got the stuck shifter working but this bad news was no reward! p.p.s. We need to find a way to let Chinatown have their hub this CicLAvia! Seriously! If we all complain loud enough it might have an effect. UPDATE: 10/2/2013 7:43 PM PDT: CicLAvia’s PR director says Chinatown hub to be haggled over in meeting with mayor, CM Cedillo, LADOT, tomorrow, Thursday October 3, 2013. Hub will open, might have shortened hours. Stay tuned and stay engaged! UPDATE: 10/3/2013 1:08 PM PDT: CicLAVia’s Chinatown hub will be open but hours will be cut short to make way for estimated sell-out crowd at Chavez Ravine play-off game for Los Doyers.